** Pulled directly from the band's own website (http://speedtheplough.com/) here is what you are looking at when you buy this beautiful retrospective for your own personal music collection! And yes friends, you should do just that if the idea of shiny pop (that's clever and performed by seasoned musicians!) with classical music elements appeals to you even a little bit! • A 17-song “Best Of” CD culled from our first four long out-of-print albums on Coyote and East Side Digital (the eponymous first, Wonder Wheel, Mason’s Box, and Marina). • A split 12" album with six brand new songs grouped together under the title Tag Sale, a return to the lush, pastoral sound of our earlier albums. And on the flip side five live songs from our 1993 appearance on WFMU’s Live Music Faucet. • A 16-page booklet featuring photos of all the band’s lineups, along with reminiscences by Speed the Plough members past and present. • A download card entitling you to digital versions of all of the above, along with 10 additional live tracks from Mountain Stage, WFMU, and Maxwell’s, and an interactive version of the booklet with links to more songs and videos. *** Speed the Plough's strength lies in their ability to offer near perfect, blissful pop/indie rock with classical musical elements. I would purposely use the words playful, colorful, comforting, dream-like and endearing to describe the music of STP. In what proved to a unexpected side-effect to this remarkable collection I was whisked away to my carefree childhood. Just as certain smells can trigger flashbacks, STP brought about visions from long ago. I'm dating myself here, but as a child I was comforted by not just The Beatles and The Beach Boys (two bands whose lush pop arrangements play a part in the music of this Jersey outfit). I remember the sense of wonderment that was to be found in The Mamas and the Papas, Peter, Paul & Mary, Crosby, Steels & Nash, The Byrds, Simon & Garfunkel, Jim Croce, John Denver, Cat Stevens, James Taylor and Arlo Guthrie. Life was so much more simpler back then and everything felt free and open to endless possibilities. And that was without all the endless electronic devices we now find ourselves slaves to! It's the age old adage that less is more and here on "The Plough & The Stars" that saying rings absolutely true! STP offer complex arrangements no doubt, but here it's presented as rather quaint pop with more of familiar, home-town acoustic/electronic rock band vibe to it. That takes nothing away from the the band's crafty/orchestrated sound (especially as this band's work takes a cue or two from highly inventive outfits such as Traffic and The Velvet Underground!) or the fact that STP channel the spirits of many a great 60's rock/psychedelic rock band (Jefferson Airplane). It's simply that STP offers comforting pop that can be enjoyed as much by pre-teens as those in their golden years! And it's all easily accessible and digestible! 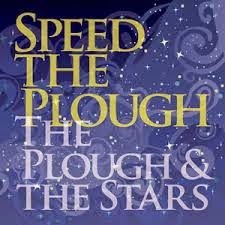 Prior to receiving this retrospective CD I can honestly say that I had never heard of Speed the Plough and now I find myself wondering exactly why that is? Maybe it's because STP are not trendy enough for today's kids or the fact that this wouldn't be considered Top 40 Pop? Who knows? What's important though is sharing music like this with our diverse readers. I know I'm not alone in having a wide ranging taste in music. That's why Heavy Metal Time Machine has, under my watch of course, taken more of an approach of anything and everything can and will be reviewed here these days. Need more info on this shinning chamber pop band? Why not head over to their Facebook page then?